If stiff and sore joints make getting out of bed in the morning a chore, and climbing stairs feels like a battle, you may be suffering from osteoarthritis. The most common form of arthritis and the leading cause of disability today, osteoarthritis led to 992,100 hospitalizations in 2015. It is found in the majority of people who are over 65-years-old and 80 percent of people over 75; if you are obese or put prolonged stress on your joints, you are even more at risk. Osteoarthritis is caused when a joint progressively degenerates, whether knee, hip, ankle, spine or toe. This causes the breakdown of the cartilage cushioning around the joint. As a result, the bones rub together, causing achiness, instability, buckling or loss of function. You may also notice increased boniness, enlargement and/or deformity of your affected joints. These symptoms can develop gradually, be intermittent or slowly fade as you get more active throughout the other day. However, even though your discomfort might not progress past the mild-moderate level or may not seem permanent, you should still address your joint pain with your primary care physician. Eventually, osteoarthritis could cause you to limit or refrain from exercise, which can put you at risk for a host of other obesity-related complications. Osteoarthritis limits peoples' activity levels more than heart disease, cancer or diabetes. It's a common myth that you should not use or "wear out" a joint. Not only will regular low-impact exercise not increase the development of osteoarthritis, it will help you maintain a range of motion, muscle strength and a healthy BMI. Avoiding weight gain, or losing weight if you are already overweight, is the single most important factor in preventing and treating osteoarthritis. You may be surprised at the small amount of weight you'll need to lose to take a great amount of stress off your knees: losing just one pound can alleviate between 30-60 pounds of pressure. Depending on which joints are bothering you, your doctor may also be able to recommend assistive devices to help you stay active, such as shoes with good shock-absorbing properties or a cane. There are also some supplements that are proven to be effective in the treatment of osteoarthritis, including glucosamine sulfate, chondroitin sulfate, Vitamin D and S-adenosylmethionine. Make an appointment with your primary care provider if you have chronic joint pain or think you may need a referral to an orthopedist. If you don't already have a primary care provider, visit mygbmcdoctor.com to find one who is the right fit for you. Addressing osteoarthritis or other forms of joint pain and inflammation now is a great step to take in preventing weight-related diseases and injuries in the future. If you’re at risk for diabetes or are living with the disease, there’s one more item you should add to your health to-do list — getting regular eye exams. “Poorly controlled blood sugar can lead to a number of eye problems, so it’s important to work with your primary care physician to make sure your A1C level, which reflects your average blood sugar level over several months, is in the appropriate target range,” explains Tanvi M. Shah, MD, a board-certified ophthalmologist at GBMC. While cataracts and glaucoma also affect people who don’t have diabetes, if you’re living with this disease, you’re 60 percent more likely to develop cataracts and may develop them at a younger age. Patients who have diabetes are also 40 percent more likely to develop glaucoma. To learn more about ophthalmology services and primary care at GBMC, visit www.gbmc.org/ophthalmology and www.mygbmcdoctor.com or call 443-849-GBMC (4262). Eat Healthy at The Yard, Hon! Cheering for the O's at Camden Yards is a time-honored Maryland tradition, but when did peanuts and Cracker Jack become funnel cakes, loaded nachos and fried mac 'n cheese? Indulging in special foods can be part of the fun of a day at the yard, so don't worry — you don't have to choose between bacon on a stick and carrot sticks. The stadium offers a variety of lighter options for people who want less caloric, more nutritional food at the game. Dempsey's Brew Pub & Restaurant (Eutaw Street – in the Warehouse) serves plenty of fried favorites, but their menu includes items for waistline-watchers, too. Choose a greens-based salad, like the Bistro Salad, Baby Arugula Salad or The Dempsey. Skip fatty add-ons like bacon, cheese and croutons; they can ruin the point of ordering a salad! Instead, request extra veggies such as cherry tomatoes, shredded carrots and avocado. For an added dose of low-fat protein, order your salad topped with chicken breast, tuna, shrimp, hard-boiled egg or black beans. Request a vinaigrette (not cheesy or creamy) dressing on the side. Baseline Burgers (Sections 27, 47, 348, 370) offers turkey burgers and veggie burgers, both of which are lower in fat and overall calories than traditional beef burgers, while still serving up a filling dose of protein. Sometimes you just need a taste of Old Bay! Skip the loaded crab waffle fries and fried softshell crab sandwich and opt for a cup of Maryland Crab Soup from Old Bay Seafood (Section 43). Though the sodium will still be high, at least you'll get a serving of veggies in the form of lima beans, corn, carrots and tomatoes while hitting the crabby craving. Fries, chips and pretzels are all easy-to-grab snacks, but they are loaded with empty calories, offering little-to-no nutritional value. There are fresh snacks available if you know where to look: Eutaw Street Grill (Eutaw Street) has roasted corn on the cob; TAKO-Asian (section 49) serves edamame and veggie chips and Eutaw Market (Eutaw Street by the Orioles Team Store) sells fresh fruit cups. When you've had your meal but your dessert compartment remains empty, do your best to steer clear of the ever-present funnel cakes. Flying Fruit Fantasy (section 24) makes fruit shakes, smoothies and yogurt. They are still sugary but not as huge of a calorie bomb as other tempting options, such as the battered and deep fried Berger Cookie ice cream sundae. Avoiding gluten can add an additional challenge to eating out and making healthy choices. Though several of the classic burger and dog stands at Oriole Park are now offering gluten-free buns, try these lower-cal options: Gluten Free Veggie Wrap from Eutaw Market (Eutaw Street), baked beans at Boog's BBQ (Eutaw Street) and the Pad Thai Cold Noodle Salad from TAKO Asian Bistro (section 49). If you're lucky enough to be in a suite, eating healthy has never been easier. Choose from the following hearty whole-grain selections: Roasted Vegetable Panini, Cucumber Greek Salad, Heirloom Beet and Quinoa Salad, Whole Wheat Avocado Wrap and Sunflower Powerhouse Sandwich. In recognition of their meaningful leadership and service contributions to their communities, GBMC family members Heidi Kenny-Berman, Esq. and Jeannette M. Mills were honored by The Daily Record as Top 100 Women for 2016. Over the past two decades, more than 1,000 high-achieving Maryland women who demonstrate outstanding professional accomplishments and community involvement have been highlighted, and GBMC is pleased to have two more of its own added to the esteemed list. 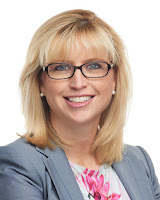 Baltimore attorney Heidi Kenny-Berman is Treasurer of the GBMC Foundation, a member of the Philanthropy Committee and Chair of both the Annual Fund Subcommittee and Legacy Chase Committee. She also volunteers with several other impactful Maryland organizations, including Family and Children's Services of Central Maryland, the Maryland Multi-Housing Association and the Calvert School. 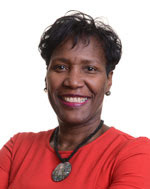 Commissioner Jeannette M. Mills of the Maryland Public Service Commission serves on the GBMC HealthCare Board of Directors and is a member of the Compensation Committee. She was inducted into the Top 100 Women Circle of Excellence in honor of her third time being chosen as a Top 100 woman. In addition to her work with GBMC, Commissioner Mills serves on the boards of the Reginald F. Lewis Museum, the Virginia Tech College of Engineering and the Committee on Energy Resources and the Environment for the National Association of Regulatory Utility Commissioners. GBMC celebrates Ms. Mills and Ms. Kenny-Berman for their valuable commitments to their communities and their well-deserved distinctions as Top 100 Women. Place the chicken in a freezer back with the air squeezed out, and pound each breast down to ½ inch thickness. In a bowl combine the egg white and evaporated milk and mix well. In a separate bowl, combine the breadcrumbs and crushed oats and mix well. Coat the chicken breasts in flour and shake off the excess. Dip the chicken breasts in the egg and milk mixture, and drain off the excess. Then dip the chicken breasts in the breadcrumb mixture to coat, and shake off the excess. 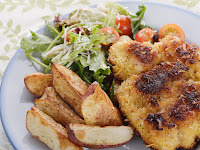 After all chicken breasts have been coated, discard any leftover breading mixture. Heat oil in a large sauté pan. Stir fry the chicken over medium-high heat on one side until golden brown, about 2-3 minutes. Turn carefully, and pan fry the second side for an additional 2-3 minutes or until golden brown. Remove from the pan, and place on paper towels to soak up excess oil. Place on baking sheet, and finish cooking in a 350 degree oven for about 5-8 minutes (to a minimum internal temperature of 165°F). Serve 1 cup salad with one piece of chicken.